That’s Arlo in the photo. And he was – content and carefree. He was one heck of a great dog. They live by less complicated rules than us, more honest and straightforward, and they’re always grateful for such little things, like touch, dinner and most of all, our presence. I love the way you wrap me in your thoughts and feelings and send me off with a burst of grateful laughter as your day begins. Nice picture you just painted, Sal. Oh! This poem is so beautiful, filled with love, gratitude and caring. The companionship of animals is precious, and the undemanding loyalty of their love touches us in a way that no other love quite does. Thank you for your kind comment. I think I sense another animal lover. Each of them blesses us when they share a part of our lives. They have a way of showing us how to live in the moment; to open our hearts without fear – just gratitude. We are so lucky for their memories! I don’t remember The Roches, but my sweetheart (who is a man) probably will. He has just about every band and song from the 60’s on up stored on his little i-gadget thing and he knows all the words, too. He likes to sing along with them in the car; problem is, he can’t sing. 🙂 I’ll ask him to find me the song. Are you going to adopt more cats? Whenever I lose a dog, I grieve so much, that I usually break down by the third day, drive like a mad-woman up to the sanctuary and get myself another senior to foster. After each dog dies, I can feel them with me, and even sometimes hear their collar tag clink in the garden or by their dish. It’s like they haven’t felt able to let me go. When I bring home the next foster, I feel my old dog relaxing, as if they know I’ll be alright now, and so will their golden buddy who, I swear, they choose for me. Even though it takes a while to get used to the stranger, I feel that the new dog is grieving too – they lost a family somehow. So we grieve together and comfort each other, and before you know it, a couple of months have gone by and we don’t remember what it was like not having each other to play with, walk with, groom and cuddle, eat sweet potateos with; I don’t know how people can live without animals. Lucky us. Thank you so much, Amanda. Your words are truly comforting – brings out a whole new flood of tears, but tears heal – washing away the grief. 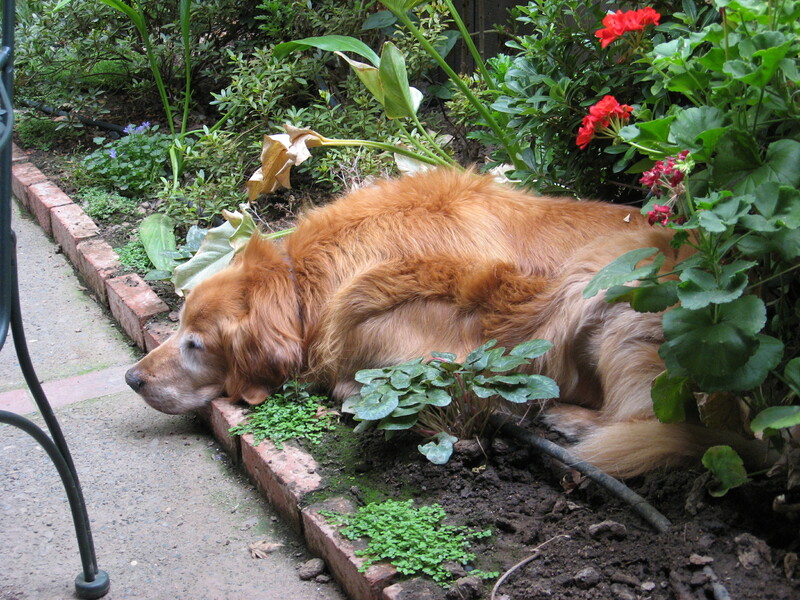 When I got home from the vet’s, I went out to Libby’s patch of the garden where she dug herself a cool spot and lay in the shade everyday – the same place where Arlo and Shadow used to lay. I found three winter lily leaf sprouts – two tall ones and one short one in the middle, growing through the freshly dug soil (I never planted them there). I felt it was my two old boys, Shadow and Arlo letting me know they had Libby between them. They’re taking care of her now. Your beautiful poem makes me think of the three of them running and playing together. Thank you so much, Barbara. Strange – these hours, these rooms without Libby in them – yet I still feel her with me. Now I feel bad for telling the whole world – poor Libby – here she is preparing for life on the other side, and the world is reading all about her halitosis. St Libby will cure all ills with one blow of her heavenly breath now, I’m sure. Bless her. Thanks, Eaton. Faithful being the key word. They still follow me where ever I go. Oh your poem brought tears to my eyes. I experienced the same with my cats, Mr. Brat, Peni, and Ari, as each one followed the other to another place. It never gets easier. You have paid a beautiful tribute to Arlo, Shadow, and Libby. Thank you!! Your cats must have been truly loved – connecting with their loss through a poem is a tribute to them too. Lovely. All the dogs in my life have stolen pieces of my heart and revealed parts of me I’d never known. I really loved this. Thanks, Talon. You are so right, they take parts of us and plant them, then we grow – lucky us to have these angels in our lives.